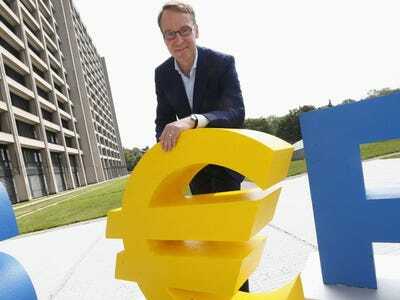 REUTERS/Ralph OrlowskiBundesbank boss Jens Weidmann is one of the central bankers speaking in France Friday. European stocks are mixed early Friday morning. US futures are up slightly: the S&P is 1.5 points higher and the Dow is up 15 points. It was a mixed session for Asian markets: Japan’s Nikkei closed up 0.52% and Hong Kong’s Hang Seng closed down 0.42%. The big economic news today comes from the US, with the jobs report out at 1.30 p.m. GMT. We’ll get non-farm payrolls, earnings growth, and the unemployment rate, which analysts expect to stay at 5.9%. A bundle of senior central bankers are also talking at a conference at the Bank of France, so expect lines from Fed chair Janet Yellen, Reserve Bank of India governor Raghuram Rajan, Bank of England governor Mark Carney, and Bundesbank chief Jens Weidmann.